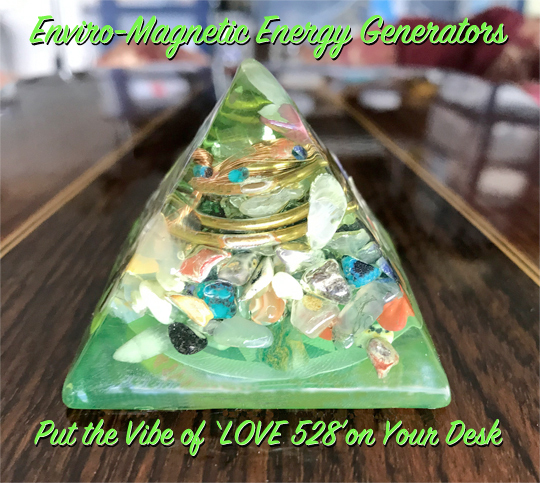 This hand-crafted, artful, and functional pyramid energy-generator makes a great gift for environmentally 'conscious' people who want to surround themselves with 'LOVE 528' frequency for protection and healing. This device can be placed in any room, next to your bed or desktop, to reinforce the great 528 love energy that radiates from the quartz crystal at the top of the pyramid, generated by an electro-magnetized copper coil radiating through a 528Hz frequency-cured crystallized vegetable resin matix. This product can be purchased from this store for Only $49.95 But why not make hundreds of them to sell online, in retail stores, or give as gifts. If you are a bit handy, creative, artistic, want to put your skills and 'good vibes' into the world, then follow Dr. Horowitz's simple instructions, and you too can make these beautiful and functional pyramids, or several other molded designs that you decide to make. It's your choice. Learn from the most knowledgeable source of 'do-it-yourself' bio-energy equipment research and development, Dr. Horowitz, who collaborated with several of the world's most successful artists, jewelry makers, and scientists in designing and manufacturing several most amazing energy-generating products and equipment used for natural healing in the world today. Simply by placing these devices near you, you'll gain lots of love vibration reinforcement. Dr. Horowitz's video instructional guide, supplemented by detailed graphics and text, directs you step-by-step in manufacturing your own non-Hertzian frequency broadcaster. These electro-magnetically-enhanced 'orgone generators' make beautiful and functional gifts. You can order one hand-made pyramid for Only $49.95, or a '3 pack' for Only $125. Or you can invest $900 here, and a bit more for incidentals as you go, and make dozens to start a business. This video is one of four (4) commercially-valuable equipment manufacturing instructional programs featured in Dr. Horowitz's 12-credit hour certified "Frequency Rehab Course." You might want to take this Course before or after you purchase this instructional program. 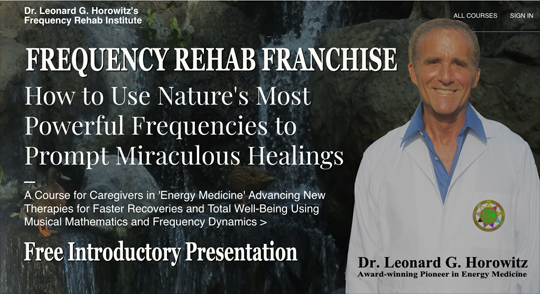 (The total Course trains you to own and operate a virtual 'Frequency Rehab Franchise' in your area.) This is great for natural caregivers and health professionals too. Click the button below to add the How to Manufacture Enviro-Magnetic Energy Products by Dr. Leonard G. Horowitz to your wish list.